This Tribal Tattoo Bouncer Hangover Glass Bong is a very interesting piece of glass art that will get you high! It is made of a bouncer base tube of 22cm height and 36mm diameter. It comes with a detachable socket of 14.5mm diameter, used as a diffuser, in order for your smoke to spread into the water chamber. The socket connects to a slide bowl for placing your tobacco or herb. Your bong includes also a kick hole at the height of the socket, which will give you the option of enjoying an alternative toke angle. 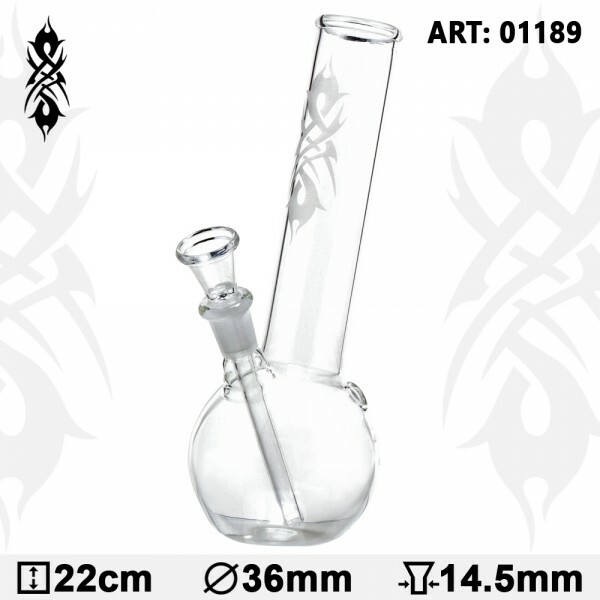 With the Tribal Tattoo logo featuring along the tube, the bong ends up in a comfortable slide mouthpiece ring through a bent neck, which will offer you a more comfortable grip in addition to a funny sense of smoking.